Pretty much from the word go, I fell in love with the idea of this series – mysterious goings-on at a Gotham boarding school? Teen sleuthing, with a side of Bat-history? Why yes, please. And while this series kills it in terms of atmosphere and art, I think on the story side it still is finding its way, even after six issues. It’s all intriguing, to be sure – but overall it kind of feels like there’s more ambiance than plot. But still – I mean, it’s a boarding school. In Gotham. How can you not love it? And as for this story’s dynamic duo, Maps and Olive make a wonderful pair – their friendship is the bedrock of this story, and from the first page, it works. Maps is a hilarious bundle of enthusiasm, game for any adventure, which makes her the perfect foil for Olive’s withdrawn, somewhat troubled self. Olive, you see, is having a tough time – a mysterious something happened to her over the summer, and clearly it’s still affecting her. And as Olive’s backstory is slowly revealed – though frankly I think too much is left unsaid, and for too long – along with a dangerous school secret or two, Maps provides much needed humor and levity to the proceedings. Really there is just no denying the fun to be had romping around with these two in the ominous shadow of Gotham City. But as for the mystery side of the proceedings – well, in terms of plotting, things are pretty light. As I said before, the atmosphere is top notch – Karl Kerschl’s art is ridiculously gorgeous, and the sense of creeping menace he brings to each page is utterly delectable – but in terms of clues actually uncovered, mysteries actually revealed… Well, there’s just not all that much ground covered here. And I do blame that partially on growing pains, as this series is clearly still figuring out its tone and pacing – but I also think the writers leaned a bit too much on atmospherics instead of actual plot. And well, you can only hint mysteriously at things for so long before as a reader, I just start to get annoyed at the lack of payoff – clues and reveals are the name of this game, and I think this book could have used more of both. Because much as I love a Bruce Wayne cameo (and wow is he young and good-looking in this series), and fun boarding school adventure tropes (a mystery wing! Secret Societies! Getting the Scooby gang together! ), at the end of the day, I just want to know more about Olive’s story/mystery – and this book never quite took me there (or at least, not far enough). And frankly, going forward I think this series needs more of an over-arching plot, more of a story spine, to really come into its own – but at the end of the day, I do care about these characters, and I’m more than willing to go along for the ride, even if it is a bit slow at times. And really, all the fabulous C-list Bat-villain cameos alone are worth the price of admission. So no, this series isn’t perfect (aside from the art, that is), but I’m still completely in love with the idea of it all, and I’m genuinely excited to see where they go next. Because if this series continues to develop and grow, it really could turn into something special – and become exactly the kind of Gotham adventure I’ve always wanted to read. …a fun romp that manages to appeal to Bat fans both new and old. …a little bit CW television series and a little bit Harry Potter, with a wee touch of manga-inspired storytelling. 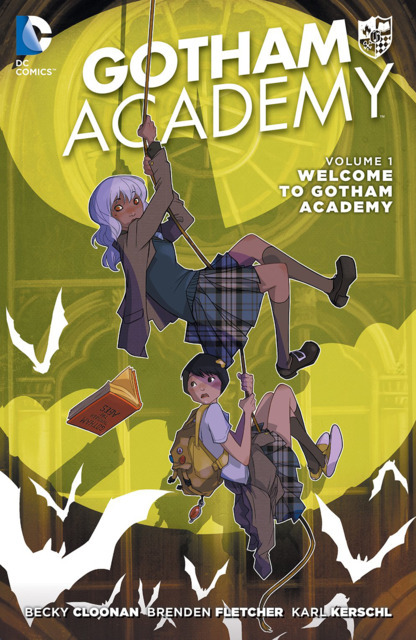 While that might all sound like an awful mix to some, Gotham Academy actually turns out to be a really fun and charming book.